Welcome Aboard IHC185™ Internet Horology Club 185 IHC185™ Discussion Site Main Page BUY AND SELL HERE, THE IHC185™ TRADING MART IHC185™ Members Business Directory Chris Abell, Certified Watchmaker Taking Work. I am currently available to take on watch service and repair. Chris has done a lot of work for me over the last few months, and his work is impeccible. I'm constantly amazed at how my watches come back in perfect beat, and I rarely have to tweek any regulator to have my watches keeping absolute railroad standard accuracy. My most recent return is an 1884 Elgin grade 50 15j convertible pocket watch, and it's giving my 992b and 992e a run for their money in dead on accuracy over a week's time. I have not had to reset my grade 50 since I got it almost 2 weeks ago. For what it's worth, I HIGHLY recommend Chris Abell to you for watch work. Chris glad too see you are taking in work there is a big demand for watch repair on the older pieces, I have heard some good comments about your work. Chris I hope you don't mind but I put a link under my "ME" page to you for watch repair. It seems so many ask me if I do repair work and I get tired of telling them no. Maybe this will stop some of those emails and get a little business for you. Thanks Mark and Sammie for your kind words and support. I also had sent Chris some watches and he did a great job. For example a 16 size Howard series O I sent had gray plates and came back looking like new. He does it right and has quick turn around which I greatly appreciated. My only complaint is that his English accent doesn't sound totally genuine. I try to turn most work around in about 7 days subject to parts. I can personally attest to the friendliness, competence and fast turn-around of work from Chris Abell. He has handled complex restorations for me as well as simple repairs. The excellence of his workmanship and the reasonableness of his pricing will keep me coming back. Call him, his accent is cool and I think it's real. Chris did a great job for me and his turnaround time was quick!!! I needed a staff for my watch made by the Philadelphia Watch Co. and I could not find a staff available anywhere so Chris turned a staff, fitted it and did an outstanding job on my watch!!!! I emailed Lindell some before/after photos of a KW 18s Illinois, and my Waltham model 1883 before he went to Dearborn so you can see what Chris started out to work on, and what I ended up with. Hopefully Lin will get time in the near future to post those here to show the kind of work Chris is capable of. CLICK FOR: "Chris Abell will make it well..."
Well, I'm a believer in Chris’ work. I just received back my Hamilton 950 and what a change! Chris did a super job and I had it back within two weeks (between Texas and Canada). Money well spent. Chris, you have my vote! Keep up the great work! 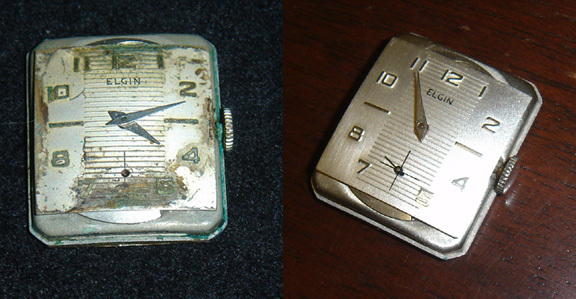 I have an old Elgin 17 Jewel pocket watch that belonged to my Father who passed away in 1966. I had never seen this watch run. My Mother had attempted to have it repaired, but it came back in worse shape. I had given up on ever seeing this watch run, until I saw this thread on this board. I contacted Chris and he took a look at the watch for me. 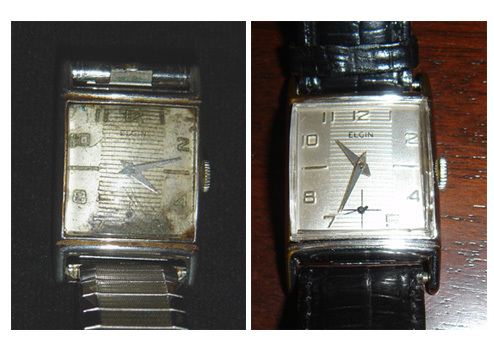 He confirmed that there was a lot of damage to this watch, but said it could be repaired. Today I got the watch back! WOW! It looks and runs great! Chris did a wonderful job on my Ball-Hamilton 999B. The watch looks and runs great. His turnaround time is super! It was money well spent! Thank you, Chris, for a "job well done!" We need good watchmakers around! I agree with Mike wholeheartedly!!! I sent Chris my great Uncle's watch that was a real disaster!!! It held a very strong sentimental value since I remember taking it out of my mother's jewelry box as a kid and being fascinated by it. It really was the watch that peeked my interest as a child and returned me to the hobby. Unfortunately I must have been harder on in than I recall but i sent it to Chris and had him do a restoration on it. I really wasn't sure it could be repaired and so i didn't know what to expect. Well i have received it back and I now have a real understanding of what a professional can do because it looks like new, the dial is perfect and the movement looks like the day it was purchased!!! I really cannot believe how nice it looks, I can't wait to show my mother (it was her Uncle's watch) I am sure it will bring a tear to her eye. The best part was the price Chris is a tribute to his profession for sure. ENDING Sunday 7th, Sante Fe Special HC in our members only auction section. Just in case anyone missed my posting in the wristwatch forum, I have to add something here. Chris did an amazing job with not much to work with. I am totally thrilled to be able to post these pictures twice. All of the gushing that everyone is doing for Chris is COMPLETELY warranted!! I am totally and entirely thrilled with my end result. As I'm guessing you can tell from the pictures! Thank you Chris. This was my grandfathers watch, and I think my mom will probably cry when she sees it. Don’t forget to keep checking my for sale web page I am always adding watches and items I have shown in the past here on 185. I would like to add to the list, my appreciation for Chris Abell's incredable work. He brought an old wrist watch back to life, and dressed it in some fancy duds. My wife thought I had purchased a new watch. Quick Reply to: Chris Abell, Certified Watchmaker Taking Work.